Kampung Sumber Alam welcomes you with the pleasure of traditional Sunda architectural bungalows surrounded by spiring water pond, beautiful garden and embraced by harmonious and fresh air of Mount Cipanas scenery. Enjoy this serene atmosphere while dining various traditional parahyangan menus and accompained by singging birds in the morning, and the moon light's gleam will make your night coffee time more enoyable. There are 3 types of bungalows at Kampung Sumber Alam namely: Arileu, Bungalow, and Babakan Siluhur. Not Far from resto and cafe', you can find our traditional architectural Sunda bungalows. We create them only to comfort you and your family. Further more you can enjoy the terrace above the spiring water pond which is accompained by the sound of water stream. Also we believe that the beauty of water plant on ponds and the shady unique West Java tress. Could calm your mind from the hectic office activity. 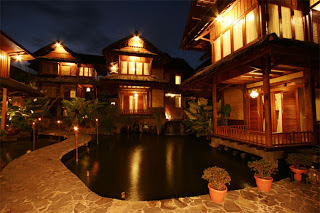 Enjoy and the feel the romantic atmosphere through the reflectio of lamp's gleam on the spiring water pond in the night. Then in the morning you can see the beauty of rissing sun behind the montain which surrounding Sumber Alam Resort. This unforgettable nature... Definitely. The Sumber Alam Resort's Suite Room have various types with their floor and wall made from wood. Their wooden decoration lamps are specially made to create the interior atmosphere just like the face of traditional Sunda "Khas Cipanas".